The basketball team Maccabi Tel Aviv is going to play against the Brose Baskets tonight at 7 pm (11/9/2015), in our hometown Bamberg. 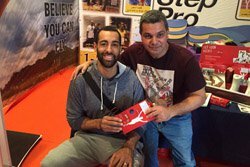 In the picture, you can see our Israelian partner Fit Step Pro welcome them to his shop in Tel Aviv – of course showing them our sports compression line o-motion. Good luck and fair play to both! May the best team win.